Students stop often while reading to synthesize the information gained from texts to form opinions, cite evidence to support their conclusions, change perspectives, develop new ideas, and, in general, enhance a personal understanding of the concepts presented in a text. I can explain the difference between retelling, summarizing, and synthesizing. I can read independently and determine my opinion. I can share my thoughts with a partner or group, listen, and determine what I believe as a result of talking to others. I can disagree with others and try to convince them of my beliefs proving my thinking with evidence. I can choose an appropriate reader response strategy to match my task. I can collect information while reading and determine a theme and cite evidence to support my thinking. I can read several sources, synthesize, and explain the gist in my own words. Getting started: Are we retelling, summarizing, synthesizing? Below is a silly story I heard on the radio. I'm retelling it. There once was a squirrel who went into an ice cream shop and asked the clerk, "Do you have walnuts?" "No. Sorry. We're out of walnuts today." The squirrel went away, but came back an hour later and said, "Have you got any walnuts?" The clerk looked at the squirrel angrily. "I told you. We don't have any walnuts now get outta here." The squirrel went out the door, but in an hour came back again. "Have you got any walnuts?" he asked the clerk. "I told you we don't have any walnuts. Listen here. If you come back here one more time I'm going to nail your paws to the counter. Now, get outta here!" The squirrel went out again but, sure enough, an hour later he was back. "Have you got any nails?" he asked. The clerk looked surprised. "No. I don't have any nails." "Great!" the squirrel said. "Have you got any walnuts?" The dictionary defines retelling as telling a story again in your own words. North Carolina requires that students include the main points - the characters, the setting, the beginning, middle and end. That's what I just did when telling this story. This is not the same word-for-word story as the radio DJ told. It’s my retelling. Summarizing is much different than retelling. When summarizing, students practice condensing the story to its most basic elements. A summary is short and more generalized. In the case of our squirrel story, I could summarize by saying, "A squirrel came into an ice cream store four times and irritated the clerk by asking him each time if he had walnuts." "Squirrel drives clerk nuts!" is the very core of this story. Students might generalize, "Asking over and over for something will result in annoying people." Or, determine an opinion, "I think the squirrel should have given up the first time." They may see a pattern: "In most jokes, things happen 3 times." They may internalize a lesson: "I think the author wrote this story to show that we should never give up." They might predict: "From this story I think the clerk will laugh and say, "Listen. Come back tomorrow and I'll be sure to have some walnuts for you." Or, they may draw their own conclusions, "This squirrel is obviously nuts." When a student works at the highest levels of synthesis, he defines his beliefs and defends his thinking with evidence, generating individual insights of texts and issues. Unfortunately, we most often assign retelling and summarizing, demanding only that students think at the lowest levels of synthesis. Examine tasks you might have assigned lately: completing homework, writing a book report, memorizing spelling or vocabulary words, reading a whole selection (without talking before, during, and after reading), writing to a prompt, answering comprehension questions, or completing 20 math problems. These are not the challenging, high-interest, problem-solving tasks our brains love like Primary Synthesis Projects, What Assignment Require Thinking, and the other projects provided as downloads on this page. The thing is, there are ways to captivate the brain and master the same objectives. I’m sure we all dream about students who are so involved they don’t want to stop learning. I’ve seen it! The downloads on this page are a start toward that goal. Please share the plans you create, too. Projects for K-2 learners or new to proficient reader strategies. 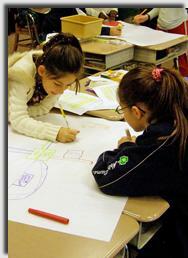 Students work alone and then in groups, drawing or writing ideas on butcher paper in their individual space. They compare their ideas and reach consensus on theme or how to solve a problem. Synthesis is the uniquely human trait that permits us to sift through a myriad of details and focus on those pieces we need to know and remember … It is the process by which we forsake much of what we learn in order to make sense of that which we determine to be pivotal for us.